Osteomyelitis is a bone infection, that may occur spontaneously or, more often, following trauma or surgery on bones and joints. Implant-related bone infections, occurring after joint prosthesis (hip, knee, shoulder, ankle, etc.) or osteosynthesis (plates, screws, nails implant for fractures or osteotomies), affect hundreds of thousands of people in Europe and Wordlwide, being one of the most challenging complication in orthopedic and trauma surgery, often requiring complex treatments in specialized Centers. The great progress made in the last 20 years in specialized Centers, however, has made it possible to achieve a durable remission or the real healing of the infection in more than 90% of cases. These improvements do require a continuous effort in updating and perfecting classification, early and differential diagnosis, prevention and treatment, with a combined surgical and medical approach. This site has as objective to disseminate the knowledge on the treatment of bone and joint infections and prosthetic, connecting patients, professionals (orthopedic surgeons dedicated to infections, microbiologists, infectious disease specialists, immunologists, pharmacologists...) and industry. Pain after Hip or Knee Prosthesis: Be Careful, It Can Be an Infection ! Infection is among the first three main reasons for failure of joint prosthesis according to many reviews. an App for your iPhone or iPAD ! VIDEO: Look How It Works ! The Filler for Bone Defects in Infections. 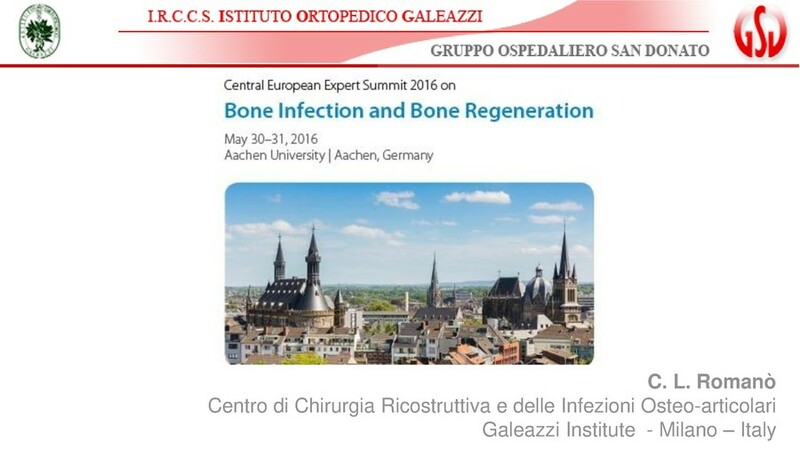 the largest, privately owned, orthopaedic research institute in Italy and one of the largest in Europe. All medical and scientific information that you find on this site are intended for informational use only and can not in any way replace the medical examination. Visitors are invited to use always the advice of their physician. The authors assume no liability for damages to third parties resulting from improper or illegal use of the information or errors related to their content. Partial or complete reproduction of text, contents, figures videos, images of this website, without written permission, is prohibited. 2017 Bone and Joint Infections. All rights reserved.